Witness the mind and body as well as techniques of the professional musicians. Play songs with the professional musicians. Take a lesson from professional musicians and play chamber music with them. From beginners to advanced-level students who want to enter competitions or attend music university, or players who have concerts to perform. The professional musicians will provide excellent advice firsthand. This group of teachers consists of popular players and professors at music universities. During her lifetime, Halina Czerny-Stefańska, one of the greatest Polish pianists, made a visit to Aomori. She entrusted us to discover and nurture people who can contribute to society in the music genre through music camps and competitions. To carry out the responsibility she left for us, we are hosting “Ika-r International Music Camp in Hachinohe” in Hachinohe City from this year, following “amf Ajigasawa Music Festival” and ” Ika-R International Music Camp in Hakodate” in Hakodate City. In 1949, with the slogan “to recover after the war” through music, Poland quickly re-built Philharmonic, the national concert hall in Poland, and re-started the International Chopin Piano Competition. Halina Czerny-Stefańska was the first champion of the competition after the war. 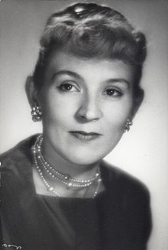 From then on, she worked as a spearhead for Chopin music around the world as one of the greatest pianists from Poland. She also focused her energy on nurturing the next generation of artists, acted as a judge at many competitions of great composers such as Chopin, Tchaikovsky and Rubinstein, and taught at universities, master classes and lectures around the world. As for Japan, she visited twice as a professor at Tokyo University of the Arts and coached the professors there in preparation for a concert of a whole set of Chopin music. The Japanese musicians who had the honor of receiving her tutelage are working actively around the nation. Nippon Arts Project (NAP). All rights reserved.